UNCHARTED 2: Among Thieves is the story of Nathan Drake, a fortune-hunter with a shady reputation and an even shadier past who is lured back into the treacherous world of thieves and mercenary treasure-seekers. Drake embarks on a journey that will push him to his physical, emotional and intellectual limits to discover the real truth behind the lost fleet of Marco Polo and the legendary Himalayan valley of Shambhala. An expanded cast of characters who reflect different facets of Drake?s character, including Chloe Frazer, Drake?s current partner and new romantic interest. Varied and exotic locations ? from lush, green swamps and dense urban environments, all the way to the ice and snow of the Himalayas. Unrestricted combat allows you to take an aggressive or stealthy approach to combat. Free-flowing "traversal gunplay? adds a unique vertical element to familiar cover-based third-person shooting mechanics, allowing you to engage in combat from any position in the environment ? even while climbing and hanging. Introduction of new traversal and free-climbing mechanics allow Drake to navigate through the environments more fluidly and naturally. Gunplay and combat enhancements, including an expanded melee system, and a variety of enemy types with advanced AI routines. High-quality cinematic presentation of scenes, characters and dialogue, all rendered within the Naughty Dog Engine 2.0. Dramatic in-game events that make you an active participant in the cinematic experience. Full character interaction with dynamic geometry. 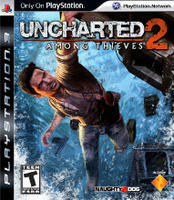 Utilizes Naughty Dog Engine 2.0 purpose-built for the PLAYSTATION 3; utilizes the PS3 technology to hit a turning point in technology innovation by recreating reality and capturing human emotion. No visible loading ? a Naughty Dog hallmark ? returns along with technology improvements in major game systems such as lighting, shadows, ambient occlusion, animation technology and physics, among many others. Robust party system allows you to remain with your friends in matchmaking and custom matches. Custom matches allow you to customize maps and modes which your party wishes to play. Currency gained in multiplayer matches can be combined with currency gained in single player missions to unlock additional content and upgrades. Character animations and environments taken from single player campaign maintain visual fidelity with no degradation. Gameplay and character mechanics identical from the single-player campaign, ensuring user familiarity and same level of quality. Proprietary Naughty Dog Engine 2.0 network code captures a broad range of gameplay data for statistics reporting on the web and for functionality like Cinema, which allows players to watch replays of matches. Cutting edge technology such as cloud-based computing allows for scalable online infrastructure to provide optimal player experience. Competitive multiplayer gameplay includes up to 10 players in heroes-versus-villains matches. Deathmatch: Up to 5 vs. 5 with customizable or pre-set game modes. Plunder: Unique style of multiplayer that encourages team work to transport a treasure across terrain horizontally and vertically over obstacles. Player boosters give you a variety of options to customize your characters to your play style or to provide an advantage over opponents. Up to three players work together in cooperative modes to accomplish set objectives with increasing difficulty and against special enemy characters. Combo system encourages further teamwork to increase a point total and currency multiplier. Weapon upgrades let you customize your weapons to your play style or provide an advantage over opponents.